… for a little while, for a well-earned and long-awaited vacation. See you all in ten days’ time! Genre blending often produces interesting results, and this fascinating novel is no exception. The premise: Harper Curtis is one of the many homeless drifters barely surviving in the Depression era, until one night he stumbles on a peculiar house that opens on different time-lines, and he finds both shelter and a terrible purpose there, that of killing the “shining girls”, young women of great potential. Already a profoundly unstable character (to say the least), Harper is somehow compelled by the House to contact his victims when they are young and then find them when they are grown up, to end their lives in a most gruesome way. He keeps acting undisturbed through the various eras – from the late ‘20s to the early ‘90s – leaving on his victims some tokens from other time periods, with no one questioning these out-of-place items until the only survivor of his attacks, Kirby Mazrachi, launches on a hunt for her assailant and starts collecting evidence, even though many leads seem unconnected. 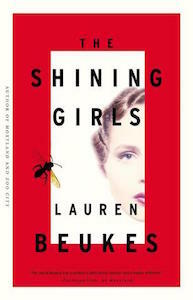 Besides this fascinating premise, the story is an absorbing read thanks to its structure: each chapter alternates between characters – the Shining Girls – and their killer, with time jumps that are never jarring despite the back-and-forth nature of their placement. There are two connecting threads that tie it all: Harper and his would-be victim Kirby. Harper is an amoral, self-centered creature who hungers for the immediate and unhampered satisfaction of his needs, with the same narrow focus of a child. He is a doubly repulsive character, because in his evilness he seems indifferent both to his acts and the suffering they cause: he makes it all look like work, like something to be done to complete a task, and he somehow comes to believe it’s the House that requires this gruesome task from him. It’s never explained whether that is true, but in my opinion the relationship is that of a catalyst (the House) finding the perfect vehicle (Harper) to carry on some obscure purpose. Harper feels too much perverse satisfaction in hunting down his victims, in observing them while he savors the outcome, to be the House’s mere instrument: when he approaches them for the first time he’s nothing short of creepy – some of them, like Kirby, are even able to perceive this in some way – and in some instances he can’t refrain from dropping a few hints about his purpose, or to state outright his future intentions, secure in the invulnerability afforded by the time hopping. Once he even warns his prospective victim this way, managing to impress her so profoundly that she wastes her life on drugs, losing the “shine” that made her attractive, so that Harper peevishly regrets that loss, not so much for the missed potential, but for the loss of his own perverse amusement. Potential is indeed the fuel that makes all these girls shine: they are all young women driven by strong motivations and the energy to carry them through – the social worker battling for women’s rights, the war widow working in a naval shipyard and fighting her own war against racial prejudice, the architect dreaming of bettering humanity’s living conditions, and many other brilliant individuals. It’s easy to see how they would have changed the world or at least the people around them, and it’s just as easy to see how such brilliance disturbs Harper, the epitome of the underachiever, the man who goes through his own life without a sense of purpose except that of removing a disturbance in his dreary path. At some point he tells one of them: “You shouldn’t shine. You shouldn’t make me do this.” Because he’s of course blameless, the fault is hers alone – it’s the kind of deep conviction the news have sadly made us aware of every time we read about women abused by partners, whose main goal seems to be the annihilation of any spark of energy, life and will to fly above the restrictions they feel empowered to impose. For this very reason, when Harper learns that Kirby survived, he’s enraged beyond measure: because she defied his will and dared survive. Kirby Mazrachi is indeed a survivor: the brief flashes about her past that don’t concern the bloody assault speak of a difficult childhood that blossomed into strong independence and a streak of stubbornness, the very same qualities that help her survive the grievous wounds inflicted by Harper and the even more difficult aftermath. She is a great blend of strength and frailties, of dogged determination and brittleness, a true heroine who is aware of her wounds and the chinks in her armor, but is ready to fight them to achieve her goal: it’s this combination of opposing traits that makes her stand out – shine indeed – and makes her believable. Kirby is an unstoppable force of nature, as reporter Dan Velasquez learns while he mentors her during the young woman’s internship at the Chicago Sun-Times: first he tries to discourage her attempts at finding the killer, in the misguided hope of protecting her, even from herself, then he understands that despite what happened in the past Kirby does not need to be saved – and in an interesting twist at the very end of the book she does take the role of savior, both for herself and him. The relationship between the damaged survivor and the jaded reporter, their verbal skirmishes and the growing affection that might or might not turn into something deeper, are some of the best elements of the story, that ends in a perfect, circular way that nonetheless is not devoid of uneasiness, because given the nature of Time we are aware that some events, some terrible occurrences, are still happening somewhere in the past. Compelling. This is the best word with which to describe this book, one of the titles that came to my attention through mention from other fellow bloggers. First there is a totally new kind of magic coming into play: osteomancy, i.e. the ability to acquire a creature’s powers through the ingestion of its bones. Then there is the fascinating background of an alternate contemporary Earth where magic rules and where things are both familiar and strange: the action happens in a very different Los Angeles from the one we know, a city whose intense traffic flows on waterways rather than highways, where the state of California is split into two separate and competing realms, the southern one belonging to the ruthless Hierarch, old and powerful. And last but not least, all the creatures that used to dwell only in fantasy settings – like fire-dragons, hyppogrifs and every other chimeric combination one could think of – are real, or at least were, since only their bones remain, as very sought after implements of magic. Our first encounter with the book’s protagonist, Daniel Blackland, occurs on a beach where he discovers, as a child, a kraken spine: his father, a formidable osteomancer training his son to follow in his footsteps, makes Daniel ingest part of the bone and the child feels the change coming over him – the strength, the power, the difference. Sebastian Blackland is both training and enhancing his son, adding magic layers to Daniel’s physiology to prepare him for the future: unfortunately the man is killed – in a most horrible way – in one of the Hierarch’s periodic purges, leaving the child alone and somewhat unfinished, forced to find his way through life as best as he can. Grown-up Daniel survives as a thief and con-man in the city’s underbelly, balancing his magic abilities with the need to keep a low profile under the constant scrutiny of the Hierarch’s police: it’s a good life, sort of, brightened by steady friends and people he trusts, until he’s offered the chance of recovering an important artifact from the Ossuary, the Hierarch’s depository of bones, the best-guarded place in Southern California. Until that moment, Daniel has more or less accepted his life of hidden safety, but it’s clear he harbors a strong, if repressed, undercurrent of unfulfilled desire for revenge, the desire to face the old man who killed and consumed his father, to finally face his fears and stop hiding, so that the temptation is too great to resist despite the inherent danger, both to himself and his friends. The preparation and execution of this almost impossible heist take up most of the story, keeping tension at high levels and at the same time fleshing out both Daniel and his friends and co-conspirators. With the exception of Cassandra, who is a skilled lock-picker but possesses no peculiar abilities, the others show how magic can change a person in unexpected directions: Jo, for example, is a shape-shifter and can take on the appearance of anyone she wishes; Moth, a big, strong guy, can heal any kind of injury on his own, and even come back from death, as we see happening more than once in the course of the daring operation. And then there is Emma, the inside woman, the fifth column from the heart of the Hierarch’s stronghold: a mysterious figure whose goals will become clear as the story unfolds and who is indeed a master of deception and misinformation, on many levels. There’s another narrative thread, running in parallel with that of the heist, following Gabriel Argent, a minor functionary who’s also related to the Hierarch but, like Daniel, fears and loathes him since the old ruler killed Gabriel’s mother just as cruelly as he did Daniel’s father. Like the other man, Gabriel tries to blend into the background, until something convinces him otherwise. It’s interesting to see how both their lives have been running on similar tracks – even though in very different circles – and how they both find the will to go against the system: in Gabriel’s case, the first step comes with Max, a human enslaved and trained as a hound and treated as such – another of the chilling elements of this dreary alternate world. One of the most fascinating details of this mesmerizing story are the cameo roles of well-known figures, like William Mulholland, the creator of Southern California’s waterways, or Walt Disney who, unlike the real-life person, is a nasty, jaded creature who loves to inspire terror and inflict pain. Both of them have grown preternaturally old thanks to magic and they add to the overall flavor of this world where corruption and brutality hold sway. The feeling is so powerful that my mind created an image of this place in sepia tones, quite the opposite of the usual visions of sunny California: the storytelling is indeed powerful in this way, because it manages to twist a well-established vision in a quite effortless way. There are however some… imperfections in this well-crafted story: the ending and the resolution seem to come a little too quickly, at least when compared with the build-up of tension. And then there’s the use of osteomancy itself: at times it takes the role of deus-ex-machina, making the characters – and especially Daniel – far too powerful, and taking away some of the sense of impending danger that had been built up until that point. In other words, what would be the use of a treacherous opponent, if all one has to do is summon the powers of a long-dead creature to beat him? 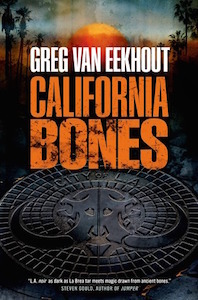 Nonetheless, California Bones is a quick, absorbing read, and I highly recommend it if you want to explore a new take on the tropes of urban fantasy. It disappoints me greatly to see a series that started with so much strength and promise taper away into uninspired repetition with little forward progression, and unfortunately this is what happened for me with Peter Brett’s “Demon Cycle”: some of the formless misgivings I expressed in my review of the previous book, The Desert Spear, seem to have coalesced into sad reality, robbing me of a great deal of the interest I held for this story and preventing me from finishing this third installment. First there is the re-treading of old ground – from a different perspective, granted, but still it becomes boring quickly enough: for example we see the now famous scene of Jardir’s betrayal of Arlen for the third time. First we witnessed it through Arlen’s eyes in Book 1; then we shared Jardir’s point of view in Book 2: back then it was acceptable because we were following Jardir’s own story and the Krasian culture, but to see that narrative thread re-hashed again through Inevera’s eyes only because the focus of Book 3 is on her, is a bit too much for my tastes. Then there is the matter of the battles with demons: now that the ancient wards are being brought into play again, strengthening the humans’ response to demonic attacks, the nighttime struggles have become a predictable clash of severed limbs, flaring magic and demon ichor spraying all over the place. The sense of danger, of a struggle against terrible foes that come up from the ground threatening life and sanity, has been lost: true, humanity had to learn how to defend itself and level the playing field sooner or later, but the way it’s been done here has removed all the suspense about the outcome. 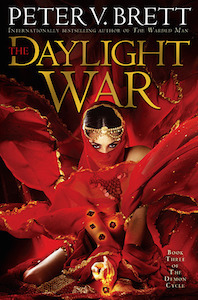 When I wrote, in my review of Book 2, that the change in humans felt somewhat forced and too easily achieved, I feared exactly what I could see happening here: people discovering new ways to fight, and new manners of warding, practically every day. I’m not questioning the forward progression, since it had to come into play or everyone would have succumbed to the demons and there would be no story to tell: what I’m questioning is the speed at which it happens, and the almost superhuman traits inherited by those who fight demons on a constant basis. When those traits started involving magic healing of wounds and perception of “auras” and thoughts and emotions (the latter happening practically overnight), I knew it was time for me to give up the struggle. Add to all that the endless repetition of some details, and you might start to see some of the reasons for my annoyance: Renna and Arlen end most of their conversations with a mutual declaration of love (are they trying to convince me or each other? ); Inevera breathes to “find her centre”, sometimes more than once in the same page; magical dice is thrown to determine which paths to choose (and the dice’s response is given in complete, articulated sentences – whatever happened to puzzling, obscure prophecies?). Even speech suffers from these repetitions, especially when artfully coarsened to show the illiteracy of villagers: I reached the point where reading the word “ent” made me break out in a rash…. Characters suddenly shift from interesting individuals to shallow representations of their former selves. Arlen is the Reluctant Hero with A Destiny, and yet he insists on being just the guy next door; Renna should have been a woman finding her strength through adversity, and instead she succumbs to poor rage management and hero worship/love for Arlen, whom she guards with ferocious jealousy; Rojer seems to incarnate a teenager’s wish fulfillment, what with two (not one, but two!) wily and seductive wives who can also double as chorus girls. As for Leesha… well, all my previous fears about her character have turned into sad reality, and she would not be out of place in a daytime soap opera. Yet, even outside of Krasian society women don’t fare all that well: their lives appear to be centered around men: their purpose is to catch any likely prospect passing their way, or to stand by their chosen man’s side and be the power behind his throne (what else? ), all the while defending their “territory” from encroaching predators, i.e. other women. And when they do act in a more assertive way, like Leesha’s mother, such assertiveness is counterbalanced by a penchant for extra-marital activities, pursued with reckless abandon, that marks them in the most negative way possible. Which makes me miss even more poignantly the only woman with true agency, old Herb Gatherer Bruna. If all of the above can be ascribed to subjective preferences, the fact remains that the story seems to drag on, more concerned with the various games of emotional musical chairs, or the posturing of warriors from both sides: the real problem, the clear and present danger represented by the corelings, is somewhat shunted to the sidelines, and what was a new and intriguing brand of foes turns into something of a footnote. 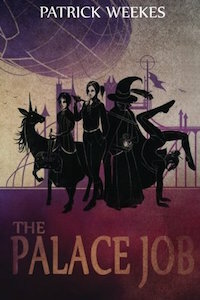 When the Tough Traveling weekly meme over at Fantasy Review Barn touched the subject of heists, a good number of interesting books was listed by various posters: The Palace Job was the one that almost everyone mentioned, always in enthusiastic terms, so it’s hardly surprising that I became curious about it. After a quick, compelling read I now understand the reason for such glowing reviews. The Palace Job has been described as Ocean’s Eleven in a fantasy setting and it’s partly true, but the story itself is a very original one, blending classic fantasy elements with a great deal of humor and tongue-in-cheek fun poked at the genre – not in a derogatory way, but with the affection reserved to some tropes by someone who loves the medium but also loves turning it upside down for sheer fun. Describing the main story would be far too complicated – too many twists and turns – and it would spoil the enjoyment of any reader, so I will stick to the basic facts: Loch used to be a soldier but is now serving a prison sentence on the underside of the floating city of Heaven’s Spire, cleaning the crystals that keep it suspended. It’s a dangerous task and the prisoners are not meant to survive it for long, but Loch and her former attendant Kail manage to escape, driven by Loch’s single-minded goal of retrieving a priceless manuscript that will insure them a more than comfortable future. To this end they enlist the help of the most ragtag crew ever imagined: a shape-shifting unicorn and a virgin (of course!) bumbling teenager named Dairy; a failed mage with a penchant for illusions; a skilled lock-picker and her gravity-defying companion; a death priestess, who used to be a love priestess, and her talking warhammer. The latter, going by the tongue-twisting name of Ghylspwr, is one of the best creations in the book, uttering the same three or four phrases in an old, incomprehensible and equally tongue-twisting language and yet imparting different shades of meaning to its words in a way that is both entertaining and fascinating. 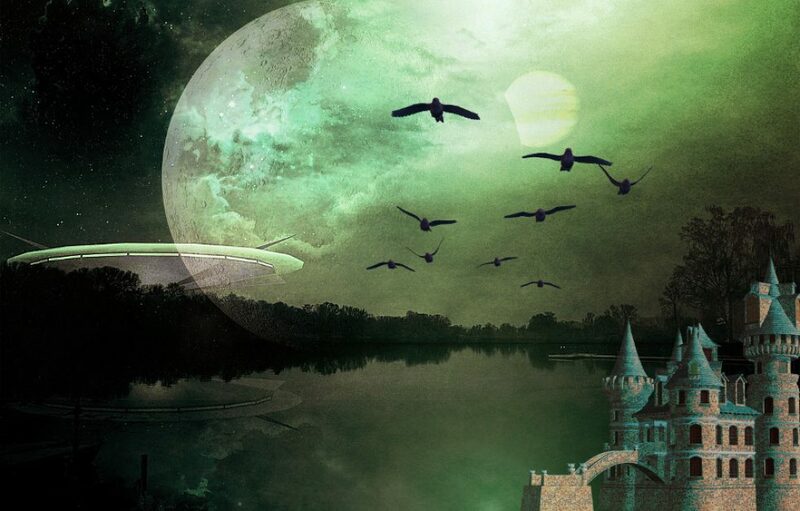 The world itself is a very unusual one, a blend of fantasy settings with a few hints of a higher technological activity that nonetheless is dependent on magic and where different parties push their own agenda with back-stabbing gusto. There are golems and zombie-like creatures, elves and chimeric beings that are both fascinating and scary and above all there is the palpable amusement of the author in describing this setting without taking it – and himself – too seriously. As I said, the plot is quite complicated and sometimes it seems to make no sense at all, but it hardly matters because the pace is so quick you don’t have time to stop and consider single events and/or their believability: action and wonderfully amusing verbal exchanges fuel this story, so the best way to enjoy it is to sit back and let it take you on its breakneck, rollercoaster ride. And to let it entertain you quite thoroughly in the process. If the plot is somehow chaotic – and I’m not saying it in a negative way, because that’s part of the book’s charm – the characters are depicted in a wonderful way: even though each of them personifies a narrative profile, they are anything but cliché, and their interactions enhance the unique qualities that they possess. Loch is a warrior, yes, but she’s also a planner and a shrewd individual who recognizes a person’s value with uncanny accuracy; she also knows how to motivate people and she builds a great, effective team out of what initially looks like a motley crew of individualistic misfits. Her comrade-at-arms and friend Kail is her polar opposite: brash, bold and above all loud-mouthed, he carries the book’s running joke about provoking fights by insulting his opponent’s mother. Kail’s attitude was one of the highlights of the book, since his penchant for insult was developed with such unabashed flair that it never turned stale, becoming instead his trademark and the expected reaction in every dangerous situation. The other characters are just as interesting and entertaining: how could one not be both amused and intrigued by a unicorn named Ululenia who’s also a shape-shifter and is visibly attracted by the group’s youngest member, a teenager who appears all elbows and awkwardness but is much more than meets the eye? And the others are just as interesting, each in his or her own way, even the bad guys: if some of them wear the guise of a mustache-twirling, evilly laughing opponent, they do so thanks to such a patina of authorial divertissment that it’s impossible not to enjoy them for what they are. Bottom line? If you’re looking for an entertaining adventure and quality storytelling you need look no further than this book: you will not regret it.